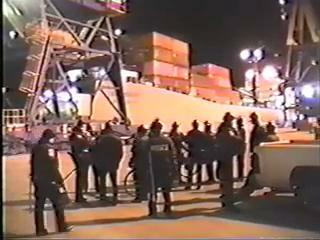 Tell President Obama & Labor Secretary Solis: Hands Off Int’l Longshoremen’s Assn’s Right to Strike! No Taft Hartley! Hands Off the International Longshoremen’s Association’s Right to Strike! Fill in the form below to send a message to President Obama and Labor Secretary Solis. (scroll down below the form to see the text). This petition sends in two parts. Clicking SUBMIT here sends to Labor Secretary Solis, and pressing submit on the next page sends to President Obama. Please press submit both on this page and the next. I strongly urge you not to impose the Taft-Hartley Act on the negotiations between the International Longshoremen’s Association (ILA) and the Maritime Alliance, and particularly against the ILA’s right to strike against the failure of the Maritime Alliance to bargain in good faith. The ILA represents 15,000 workers spanning from the ports on the East to the Gulf Coasts. They have been working under a concessionary contract for some time. Now the Maritime Alliance wants more concessions; one being the elimination of the “container royalty” for new hires. The container royalty was established in 1960 to compensate workers for job lost caused by automated container shipping. This use of automation to replace workers and create massive unemployment should require corporations to compensate the workers as a minimum and basic human right. The economic crisis that is raging among working people, is largely the result of this type of corporate greed seeking to force endless amounts of capital from the workers in the form of lower wages, the loss of jobs, higher premiums for benefits and the elimination of gains won over the years to create good paying jobs and to protect worker rights. Labor unions supported your election with funds that came from our labor, along with hard work on the ground to turn out the vote. If you impose Taft-Hartley against the ILA, it would represent the same anti-worker agenda that the Tea Party and other conservatives are promoting by their campaign to establish right-to-work legislation and cuts in social programs in states across the country, that benefit the 1% and severely hurts most of the 99%. You must make it clear in your second term, that you support the rights and demands of working people against greedy corporations and anti-worker conservatives.